The Maxlite line from TravelPro has always been a favorite of ours. This is TravelPro’s middle of the road line which dispenses with some of the super fancy additions in favor of something extremely durable and very light. For those of you looking for a simple, great bag you probably can’t do any better than the TravelPro Maxlite 5 carry on. And you’ll save some money while you’re at it! This is our TravelPro Maxlite 5 review. This is one of the lightest carry on bags we have ever seen. And the fact that the bag construction is still very durable is a testament to TravelPro's expertise in making high quality, yet affordable bags. TravelPro is admittedly one of our favorite luggage brands. This is because they somehow are able to offer industry competitive quality at a fraction of the price of many of their rivals. And the TravelPro Maxlite 5 is a great example of this ethic. A replacement for the previous (and excellent) Maxlite 4, the Maxlite 5 makes one major change that many will want to take note of: It’s lighter. In fact, they were able to shave off a whole half a pound. This doesn’t sound like a lot, but when it comes to carry one luggage, every ounce counts. At 23in X 14.5in X 9in this bag will fit well even in international overhead bins. And certainly it will fit on American carriers with no problem. It maxes out at 46 litres which is pretty admirable for such a small and light bag. For example, you’ll get more storage than Tom Bihn’s iconic Aeronaut bag. We picked up the four wheel spinner style of the Maxlite 5 carry on and absolutely loved the smoothness of the inline skate style wheels. Sure, it doesn’t have the fancy magnetic wheels of fancier bags, but the wheels are undoubtedly very high quality. The telescopic handle was easily pulled out to one of two preset lengths (about 38 and 42 inches) which is nice for my wife who is substantially shorter than me. The same rubberized contour grip tops out the handle and is still one of the best in the business if you ask me. You have grab handles on pretty much every side of the bag which is something I really look for in a bag. There is nothing worse than not having a handle to yank your bag from the overhead bin. The handles are also really well attached to the bag, with heavy duty triple stitching and rivets holding them on the bag. You won’t have any issues with these handles coming loose. Looking for something with even higher durability and quality? Take a step up with the TravelPro Platinum Elite. This will get you a few more bells and whistles and slightly higher quality build. On the fabric front, the whole bag is sprayed with DuraGuard water resistance coating so even in a rainstorm, your belongings will likely stay very dry. Tell that to my duffel bag that I took into a rainstorm in Hong Kong and came back to the hotel with soaking wet work clothes… Furthermore, there is a water resistant H20 guard on the inner lining which further protects the bag’s contents from moisture. The inside lining is actually really quite attractive, with a plaid-like pattern that makes it easy to locate items in the bag in low light. You aren’t getting any crazy bells and whistles like on-board USB power or even integrated TSA locks with the Maxlite 5 21 inch Expandable Carry-On Spinner. But to be honest, this back is great without them. Keeping the weight down is the number one goal of this bag, and it succeeds on all fronts. When I first picked it up when it was delivered to my house, I didn’t even believe there was a bag in the box! It’s that light. The Maxlite 5 carry on also expands about 2 inches if you are one of those people that tends to come home with more than you left when you are on vacation. Overall its probably not as big of an expansion as I have seen on other TravelPro bags, but it does allow for a but more to be added. TravelPro supports this bag with their Built For A Lifetime Limited Warranty. This sounds great but its really just a standard manufacturer warranty which covers manufacturer defects. You can add on the Trusted Companion Promise from TravelPro which takes the warranty more line with Briggs & Riley’s actual lifetime warranty which covers airline damage and covers shipping costs associated with any repairs. It’s nice to have the option, but the fact that this is an additional cost is not great. If you need a bag with a crazy no questions asked warranty, you’re going to want to look at Briggs & Riley. TravelPro Maxlite 5 Carry-On review round-up: Is this bag for me? For most people, yes. This bag has just enough features to satisfy most travelers, but its the weight that is amazing for me with this bag. If you want to have a four wheel spinner but don’t want to be weighed down, this is the bag for you. If you need something that is a bit of an upgrade in the TravelPro line, consider their new Premium Elite carry on. 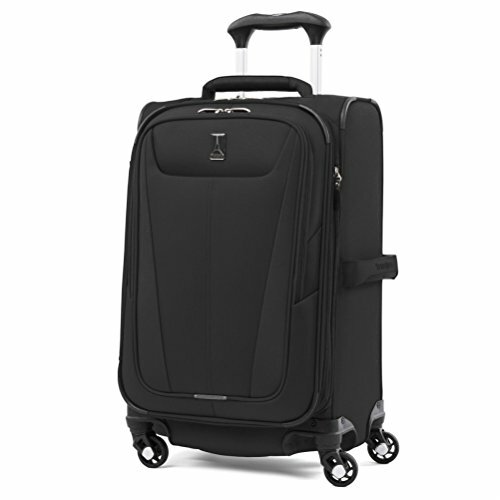 A half-pound lighter than the maxlite 4 version, this ultra-lightweight, ultra-durable, 21" expandable spinner suitcase maximizes your packing power and meets carry-on size restrictions for most domestic airlines. Polyester fabric with stain-resistant, water-repellant duraguard coating and ergonomic, high-tensile-strength zipper pulls provide lasting durability. 4-wheel spinners rotate 360 degree for a smooth roll in any direction. Lightweight yet sturdy PowerScope Lite handle with stops at 38" and 42.5" features a patented contour grip with comfortable, rubberized touchpoints for effortless maneuvering. Unique bottom tray design increases durability and stabilizes wheels for trouble-free alignment and steering.